Known as “the hotel of the arts”, it features an exceptional display of more than 1000 notable works of art. With almost a century of history, the stylish Majestic Hotel & Spa is located in a neoclassical building in the heart of Barcelona in the Passeig de Gracia. Following the recent completion of an ambitious renovation project, the Majestic embodies the timeless elegance typical of the most exclusive international hotels. Also known as “the hotel of the arts”, it features an exceptional display of more than 1000 notable works of art. Under the guidance of award-winning culinary advisor Nandu Jubany, the hotel offers sophisticated cuisine that pays homage to traditional Catalan products and gastronomy. Guests can savor the results in El Bar del Majestic, El Patio del Majestic, and in the hotel crown’s jewel, the spectacular rooftop La Dolce Vitae, with expansive views of nearly all of the city of Barcelona. On the top floor of the hotel, is also an oasis of relaxation and well-being: the MajesticSpa, the only wellness center in Europe to be awarded with the Spa Excellence. Nearby to several landmarks by Antoni Gaudí, the hotel features more than 1,000 artworks. The award-wining Chef Nandu Jubany supervises all the culinary offers of the hotel. 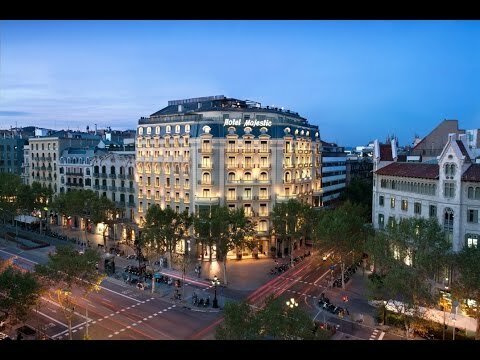 Situated in the heart of Barcelona, on the main luxury shopping avenue, allowing guests to walk and discover all the city's most interesting places. Deluxe Twin or Double bed 23SQM 247SQFT Limited view. No balcony. Deluxe City view Double bed 23SQM 247SQFT. Street view. No balcony. Executive Double or Twin beds 35SQM. 376SQFT. Spacious rooms. Sofa bed. Paseo de Gracia Double or Twin beds 23SQM 247SQFT. City view. Junior Suite King or Twin beds. 40-45SQM 430-462SQFT. Majestic Suite King or Twin. 65SQM. 600SQFT. View to Paseo de Gracia. 15km/9.3mi from Barcelona- El Prat International Airport (BCN); 3km/1.9mi from Barcelona-Sants Rail Station (YJB). "The expiatory church of La Sagrada Familia is made by the people and is mirrored in them. It is a work that is in the hands of God and the will of the people" by Antonio Gaudí. The building is still under construction which is expected to be completed during the first third of the 21st century. www.sagradafamilia.cat. With more than 100 years of experience, the third generation from the Lafuente Family is running Colmado Quilez as the best Gourmet Shop in Barcelona with the same enthusiasm and excellent service since it opened. www.lafuente.es. The last new project from Albert and Ferran Adrià opened in September 2014 with Mexican touches. They only use national and Mexican products carefully planted or bought by them. Address: Av. Mistral, 54. Enjoy a unique tour that will give you an insight into the medieval city from a new and spectacular viewpoint. www.barcelonaturisme.com/Les-terrazas-de-santa-maria-del-mar.com. The highest balcony to enjoy a cocktail with friends overlooking the city of Barcelona. Telephone: (+34-93) 434 00 35. www.mirabe.com/en. An amazing experience to enjoy one of the best collections of Romanesque art in the world on the magnificent Palau Nacional de Montjuic, constructed for the international Exposition of 1929. www.museunacional.cat/en. Find the right door with the right spiral staircase to get into the most secretive Cocktail Restaurant of Barcelona. Its owner, Mr. Díaz, will be glad to welcome you to his cozy converted private flat inspired on the 1920s New York speakeasies. Address: Avinguda Diagonal, 438, 08037 Barcelona, Spain. Telephone: (+34-932) 18 46 11. It is highly recommended to obtain tickets in advance to explore the magnificent Park Güell from Antoni Gaudí before the sunset to take great pictures of the Barcelona skyline. www.parkguell.cat. Developed from the rural road that used to connect the walls of Barcelona with the village of Gràcia in the 1800s to the consolidation in 2014 as the Shopping Avenue of Spain with more daily traffic of pedestrians. www.paseodegracia.com.